Fetal sexual organs are now clearly visible. SIZE: Almost 1 ounce (25g). Crown-to-rump length is about 3.2 to 4.1 inches (80 to 9mm). Mother's Size: Uterus now about 0.8 inch (2cm) below the bellybutton or almost 9 inches (22cm) from the pubic symphysis. 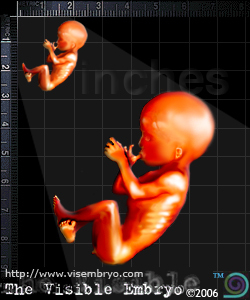 Fetus is straighter and almost erect as muscles strengthen and additional bone structure forms in the back. Eyes face more forward on face. Ears are close to final position. Philtrum, the vertical groove on the surface of the upper lip, lowers into position. Heart pumps about twenty-five quarts of blood per day (increasing to three hundred quarts per day by the time of delivery). Respiratory and digestive system - breathing, swallowing and sucking - are more developed. Torso grows rapidly, in increasing proportion to the head. Limbs are well-developed and more defined with toenails beginning to grow from their nail beds.